La Pine is located in Deschutes County south of Bend, between Sunriver and Gilchrist along US Hwy 97; Also situated along the banks of the Deschutes River within the Deschutes National Forest. This Central Oregon town was formerly known as Lapine and is now officially La Pine, but certain names use the spelling LaPine. La Pine is a rural community positioned near Newberry National Volcanic Monument and Paulina Peak, home of East Lake and Paulina Lake, where the state record Brown Trout was caught. 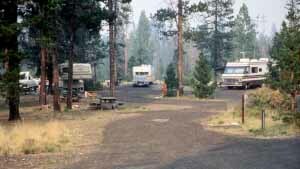 The recreation rich Cascade Lake region of Central Oregon surrounds La Pine. There is abundant Fishing, Hiking and boating at any one of the many nearby lakes in the summer. In the winter, enjoy cross country and alpine skiing at nearby Mount Bachelor, or snowmobiling through the woods and up the nearby foothills.